As the equity markets recovered from their lows, so did the euro after briefly dipping below $1.3000. The move below the big figure didn't last all that long before the bulls were back in town adding over one hundred ticks to EUR/USD. The rumour was that the ECB was exchanging Greek bonds for new securities and thus increasing the chances that the bailout will go ahead. This morning EUR/USD is trading at $1.3125 and near term support and resistance are seen at $1.3040, $1.2970 and $1.3190, $1.3215 respectively. The bounce in risk assets was very much to the detriment of the Japanese yen which gave a boost to USD/JPY allowing the pair to continue its move above the 200 day moving average. This hasn't been seen since April last year and so is believed to be quite a significant move. 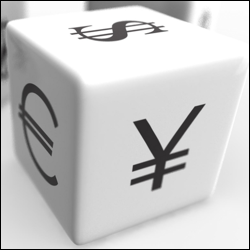 Usually during a move into riskier assets you'd expect the dollar to suffer, but yesterday's bullish economic data sent the US currency higher against the yen. At the time of writing USD/JPY is at ¥79.10 and near term support and resistance is seen at ¥78.50, ¥78.15 and ¥79.30, ¥79.50 respectively. On the forex CFD front, the euro has not been immune to the sell off in risk assets and has even been pre-empting the weakness of the past few days after commencing its sell off earlier in the week. EUR/USD is now back below the $1.3000 level as the bears seem to be taking charge again and they are hoping that this is the start of a more prolonged downward trend building up. For EUR/USD near term support and resistance is seen at $1.2980, $1.2950 and $1.3110, $1.3155, $1.3190 respectively. Ahead of news that today's Eurozone finance ministers' meeting was to be cancelled, speculation amongst traders was that Greece's proposed bailout package is in danger. The knock on effect was a third consecutive fall for those trading the EUR/USD market. It seems that China have come to the rescue at the right time and given the euro a much needed boost and we are seeing the single currency trade higher this morning at $1.3160. With European equities up this morning there may be more room for the euro to move higher. Moody's have highlighted something that we've mentioned quite regularly in this comment which is that the UK is not immune to having its prized triple A credit rating from being stripped away. The ratings agency highlights that it had not done this before because the country had been quick to start tackling the deficit, but now that growth is being impaired the deficit reduction targets are looking unlikely to be hit. The likelihood of an actual downgrade is put at around 30% chance, so significant and ever more likely if growth doesn't pick up. The highlight of the day from an economic data front is inflation numbers which should show CPI fall from 4.2% to 3.6%, a welcome sign for consumers and primarily due to last year's VAT hike falling out of the figures. The question is however, how far will inflation fall this year? Unfortunately for the consumer perhaps not as far as they would hope since crude oil prices remain stubbornly high and the BoE continues to pump cash into the system. On the forex CFDs markets, the Euro bears were happy to see a pull back in the single currency yesterday as resistance around the €1.3300 level remains a bridge too far for the bulls. EUR/USD is at €1.3160 at the time of writing and, until the weekend's vote in Greece gets the nod from the EU and IMF, upward momentum for the single currency is unlikely to be forthcoming. The EU finance ministers also meet tomorrow to finalise the PSI deal which is also keeping traders on the sidelines for now. Over the near term support and resistance is seen at €1.3115, €1.3085 and €1.3230, €1.3285 respectively. In forex futures, any account holders who went long of the euro on Friday are likely to be thanking the Greek parliament for passing approval of the austerity measures. The news that Greece are likely to get a second bailout encouraged traders to move out of any safe haven yen and dollar positions, causing a spike in the single currency as of last night. This has continued into this morning and EUR/USD is trading around $1.3275. The taste for equities and risk taking today, could see the euro move higher in line with this sentiment, but the bulls need to shake out the bears around the $1.3300 level which remains the major near term hurdle. The euro is just giving a little bit back in line with the weakness on the open of indices. The EUR/USD market has rejected the $1.3300 level and is at $1.3255 at the time of writing. Here it looks like traders are just cutting their exposure to the single currency a little ahead of the weekend as few will want too much exposure ahead of the Greek parliament vote. Considering the length of time it has taken to get to the conclusion of these recent talks, there's no guaranteeing a vote will be achieved. The short term trend still remains bullish and so we can't discount further gains unless support levels around $1.3200, which was past resistance and $1.3100 are tested. The euro remained well supported yesterday and is climbing again this morning having hit $1.3300 earlier and just pulling back to $1.3285 at the time of writing. At the moment the momentum continues to favour the bulls and the short term trend is upwards. It would seem that to put an end to this strength there would have to be some rather negative comments from the ECB today or even a surprise interest rate cut. Nevertheless, neither of these outcomes are likely, so for now it's tough being a bear of the single currency. In the forex market, the euro's recent rally seems to be gathering momentum as the Greece deadline looms and pressure mounts. The feeling that a deal is around the corner is helping lift the single currency and this morning EUR/USD is at $1.3280, building on its seven month high that it recorded yesterday. A break through the $1.3200 level is quite significant and is a further blow to the bears who continue to be squeezed. As shorts in the euro become fewer and fewer, the closing of these positions only serves to give more momentum to the rally. Soon some of these bears will probably turn into bulls, if they haven't already, possibly adding further strength. For now the short term support and resistance is seen at $1.3200, $1.3165 and $1.3290, $1.3325 respectively. The real deadline for the Greek talks has been set at next Wednesday as this is apparently the time at which a resolution has to be agreed upon in order for the necessary legalities to be formalised ahead of the 20th March bond exchange. Otherwise its default time and Greece really will exit the euro. Even though the possibility of such an event is becoming more and more likely the markets have remained surprisingly strong. This is particularly interesting since many analysts have been increasing the likelihood of a Greek exit and the politicians there have been discussing it themselves. Whilst the country has benefited hugely from being a part of the euro, the situation now makes exit a laudable outcome. They'll have all their debt wiped off and their currency would plummet, devaluing it massively and assisting in the country becoming competitive again. If the next bailout does go through then you can safely speculate that we'll be discussing the Greek issue again in the near future. We said in yesterday's comment that the euro is likely to continue it's decline until there is more optimism with regard to the Greeks striking a deal with their creditors and that's exactly what happened. Fearing an onslaught for the euro, Chancellor Merkel made a television appearance and stated "the EU cannot accept a Greek bankruptcy". This of course, encouraged forex contracts for difference investors to get long of the euro again and continued into this morning. The euro traded against the dollar as high as $1.3167 earlier, but could let off a bit of steam as the day goes on. Inline with equities, the forex futures markets are risk-off. Likewise, in the rolling daily markets, the single currency is down against the dollar to $1.3060. Until we see some optimism with regard to the Greek debt situation, the uncertainty may provide for further falls in the euro. The euro's weakness this morning is affecting its relationship with sterling too as the GBP/EUR market continues to hold onto the €1.2000 level, with the pair at €1.2062 at the time of writing. Regularly in the past sterling has lost momentum against the single currency around this area, but not seemingly this time. Pressure continues to build against the euro as, for some reason, a few currency traders seem to find sterling a slightly safer haven than the euro.